Three-time African footballer of the year, Asisat Oshoala, has called for more fixtures to be arranged for Nigeria's women's team, after a friendly against France was confirmed for the coach-less side in April. The match, scheduled for 4 April in Paris, will be the Super Falcons' first since winning the Women's Africa Cup of Nations in December 2016. Oshoala welcomes the fixture but says Nigeria need more games ahead of the qualifiers for this year's Nations Cup in Ghana. 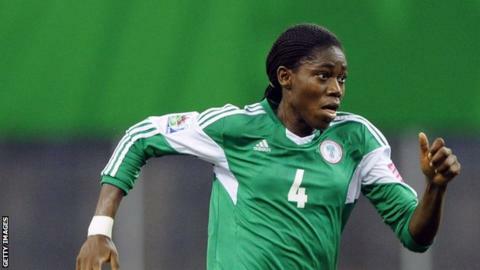 "It's a good one, a big step for us and good news for women's football in Nigeria generally but it's not enough," Oshoala, who won the Caf individual prize in 2014, 2016 and 2017, told BBC Sport. "It's not about the France game alone, but we need more games like this and we don't have to plead before we get games," she added. This year's Women's Nations Cup will take on extra significance as it will also decide the continent's teams for the 2019 Women's World Cup. Interestingly, eight-time African Champions Nigeria are still searching for a coach after American Randy Waldrum rejected the opportunity to lead the team last month. But Oshoala, whose performances for her new Chinese club Dalian Quanjian saw her triumph ahead of Chrestina Kgatlana and Gabrielle Onguene in the race for the 2017 African player of the year prize, is confident a new coach to succeed Florence Omagbemi will be announced soon. "I've had an honest conversation with the president of the Nigeria football federation (Amaju Pinnick) about this," she said. "He's been very positive and in a couple of weeks we will definitely have someone to lead the team." After the friendly against France, focus will switch later that month to securing a qualifying spot at the 2018 Africa Women Cup of Nations in Ghana as they aim to retain their continental title. The biggest challenge in Ghana will be to seal qualification for the 2019 Fifa Women's World Cup in France - in what could be Nigeria's eighth record appearance at the tournament. Nigeria are the only African team to have played in all of the Women's World Cup tournaments since 1991. However they have failed to translate their continental dominance on the world stage, their best performance coming in USA in 1999 when they reached the quarter-finals.